Before humans can exist on the surface of Mars, there is much to be learned about the weather, “soil”, and the potential use of greenhouses on Mars. On Earth we depend upon sunshine, warmth, rainfall, and suitable soil to grow crops such as tomatoes. Almost all agriculture, except for greenhouses and some extensive irrigation, is dependent upon the weather. Mars, being smaller than the Earth, further from the sun, without oceans, and having little water vapor in its atmosphere, has relatively simple weather. The atmospheric pressure on Earth is typically about 100kPa (kilopascals). On Mars it is less than 1kPa; far too low for either plants or humans. Plants can survive with a mere 5 kPa atmosphere, 2kPa nitrogen, 2kPa oxygen, 0.6kPa water vapor, and less than 0.1kPa carbon dioxide and the remainder a mixture of gases such as argon and nitrogen; whereas, humans prefer at least 20kPa of oxygen and 10kpa nitrogen (as a buffer) to work and breathe comfortably (about 30kPa). In a Martian greenhouse, astronauts will have to wear a space suit. 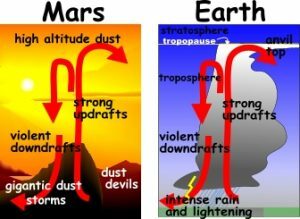 The energy that drives the weather on Mars comes from the Sun, exactly the same as all weather on Earth. However, the Earth’s atmosphere and the Earth’s oceans store huge amounts of solar energy. The surface of Mars and its atmosphere do not store very much solar energy. On Mars, solar energy heats the Martian surface during the daytime, and at night almost all of the solar energy is radiated back into space as long wave infrared radiation. Mars does have a thin atmosphere. As the Sun warms Mars’ surface, some of the heat is transferred to the atmosphere during the sunny day. As the thin atmosphere near the surface warms up it expands and rises, generating convection currents that transfer heat throughout the atmosphere. 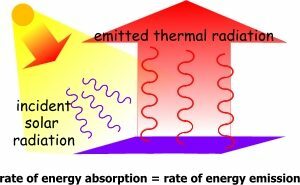 During mid-day the energy from the solar radiation exceeds the amount of energy radiated into space and the surface of Mars warms up significantly. At night large amounts of energy are radiated from the Martian surface. Since the Martian atmosphere is too thin to inhibit this loss of energy, the nights on Mars are very cold! Radiation may be considered an “element” of the weather, just like temperature and precipitation. Mars has much higher levels of ultraviolet (UV) radiation than Earth, due in part to its thin atmosphere. We know that protection against UV radiation is important to humans on Earth, but we should also remember that plants also need UV protection – and this will be even more important to plants growing (in a closed environment) on the surface of Mars. At a given temperature “air” can hold a certain amount of water vapor. The colder it is, the less water it can hold. The ratio of the amount of water it does hold to the amount of water it CAN hold is called the Relative Humidity. When the “air” is cooled so that the humidity would be greater than 100%, the water vapor in the volume turns into solid or liquid water, depending on whether the temperature is above the freezing point. At around -75 degrees Celsius (-103oF), a volume of air can hold 0.03% of 7 millibars = 2 microbars worth of water, which is typical of the atmosphere on Mars. At about this temperature, the relative humidity reaches 100%. So when it gets cold, Mars has precipitation. However, this precipitation most likely takes the form of frost, rather than rain or snow. The ground is likely to be colder than the air, and so air hitting the ground cools and the water freezes to the ground as frost. A part of the polar ice caps of Mars is made of precipitated water ice (the rest is made of carbon dioxide as ‘dry ice’). The Phoenix Lander (2008) observed water-ice clouds in the atmosphere of Mars that were similar to cirrus clouds on Earth. The water-ice clouds were detected at the top of the Atmospheric Boundary Layer and near the ground each night in late summer when air temperatures decreased. Just as on Earth, some places on the Martian surface absorb sunlight better than other places. It is partially due to this uneven heating that Mars develops strong convection currents in its atmosphere. 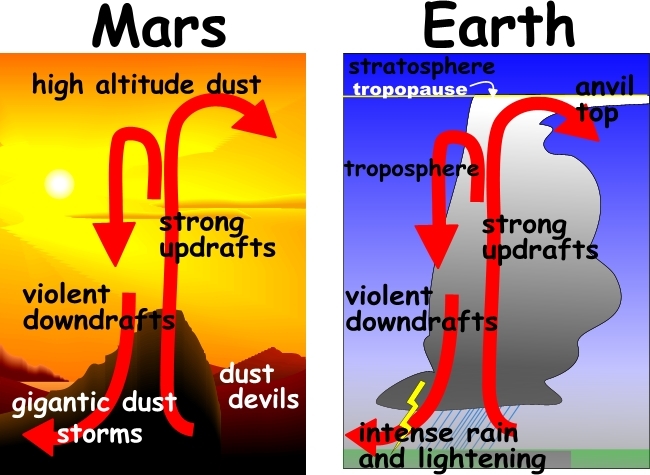 Both Earth and Mars have extensive weather features which are driven by local convection as a result of the Sun’s rays heating the planet’s surface. The Martian convection currents can be strong. Surface winds of up to 130km/h have been recorded by both Viking Landers. The winds also pick up dust from the Martian surface and can create enormous dust storms. The Mars Global Surveyor has also photographed large Martian “dust devils” and cyclonic storm systems. The Martian weather and Martian climage seem too hostile to grow crops without greenhouse protection. The Martian “soil” is about 40% SiO2 (silicon dioxide), a fine sand-like material and about 20% Fe2O3 (iron oxide) “dust”. This dust is very fine. Its texture is similar to that of talcum powder. The remainder of the Martian “soil” consists of clays, dust, gravel, pebbles, stones and rocks of both simple and complex minerals similar to those found on Earth. In effect, the Martian “soil” is not really soil as we know it on Earth. Here, we define soil as a mixture of organic and inorganic materials. On Mars, however, there has been no evidence of organic material. As far as we know, the Martian soil is sterile. How fertile is the Martian soil? It’s hard to say, but based on the results of both Viking landers and the recent Mars Pathfinder missions, the soil appears to be a much better medium for plant growth than most soils on the Earth, although Martian soils appear to be somewhat deficient in potassium. What we can say is that the Martian surface material has the potential to be used as a medium for plant growth. Note that greenhouses do not increase the amount of solar energy available for photosynthesis. Although plants can survive with less than 0.1kPa carbon dioxide they can survive with much more. In fact, most green plants prefer a carbon dioxide-rich atmosphere. On Mars, a greenhouse would not necessarily have to be a closed ecosystem. It is assumed that on Mars the atmospheric pressure and atmospheric composition within the greenhouse could be adjusted using outside resources. For example, excess methane gas could be vented outside of the greenhouse and perhaps more carbon dioxide could be added by extracting it from the Martian atmosphere, pressurizing it, and pumping it into the green house. Similarly the amount of water and fertility of the soil could be adjusted using outside resources. A student investigation associated with the building of a greenhouse on Mars is included with the Classroom Curriculum documents.